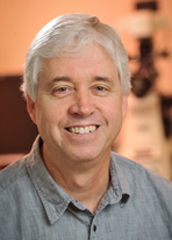 Christopher A. Klug, Professor, Departments of Microbiology, Biochemistry, Genetics and Pathology. Received his B.S. degree in Biology from Wheaton College in 1987. He received his Ph.D. degree from the Department of Molecular Genetics and Cell Biology at the University of Chicago in 1993, where he worked on early lymphocyte development in the laboratory of Dr. Harinder Singh. His postdoctoral research was in the laboratory of Dr. Irving Weissman at Stanford University, where he studied hematopoietic stem cell biology as an Irvington Institute Fellow before coming to UAB as an Assistant Professor in 1997. The major research focus of our laboratory is to understand the underlying mechanisms regulating hematopoietic stem cell (HSC) self-renewal and how normal HSC developmental programs are subverted in the context of acute myeloid leukemia (AML). We are also interested in understanding the underlying molecular events controlling cell fate decisions within the hematopoietic system, especially within the lymphoid lineages. Animal models of acute myeloid leukemia are generated by introducing fusion genes derived from commonly observed chromosomal translocations found in human AML into mouse stem cells using retroviral vectors. The genetically modified stem cells are then used to regenerate the blood system of another animal, where leukemia development can readily be followed. Two of the translocations that we have modeled in mice, the inv(16) and the AML1-ETO translocation, are the two most common cytogenetic abnormalities in AML, accounting for about 20% of all AML cases in man. The current dogma is that AML is a disease that is sustained by an abnormal HSC population that has acquired specific genetic mutations and epigenetic changes that promote leukemia development. Current efforts are underway to understand how these mutations/changes affect the stem cell population and contribute to the development of leukemia. Recently, our laboratory has also initiated studies modeling pancreatic cancer in mice. Pancreatic cancer is one of the most fatal human malignancies, with an overall 5-year survival rate of less than 4 percent. Our studies are focused on developing novel therapeutic agents to treat advanced cancer and to identify markers that would be useful in diagnosis of early-stage neoplasia using the animal models. de Guzman, C.G., Johnson, A., and Klug, C.A. (2002) The ETO domain is necessary for the developmental abnormalities associated with AML1-ETO expression in the hematopoietic stem cell compartment in vivo. Blood Cells, Mol. Dis. In press.